Pollack "Bulls Eye Mica" Modern Retro Upholstery Fabric - 17 Yards - Free Shipping! Pollack "Bulls Eye Mica" Terratex® Modern Retro Upholstery Fabric - 17 Yards - Free Shipping! This lot is 17 yards of "Bull's Eye" fabric Designed by Rachel Doriss and the Pollack Studio in the "Mica" colorway. 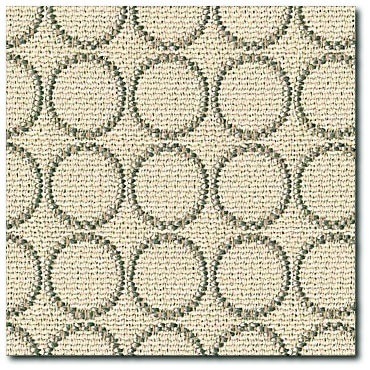 This high-quality, heavy weight commercial fabric has a mid-century design that will enhance any modern decor. Terratex® Recycled Polyester Fabric! Colors are a Natural white field with Khaki highlights. You could pay $57.00 a yard (a $969.00 retail value!) but why??? As always, we offer a premium fabric to our buyers for much less!